Millipedes are not insects, although they are distantly related. Most species are relatively inocuous, and do not sting or bite. Although superficially similar, millipedes differ from centipedes (some of which do have painful bite) in several respects. Typically, millipedes have more body segments, and two legs per segment rather than one. Millipedes move more slowly, and feed on dead plant matter whereas centipedes are eat insects and other invertebrates. 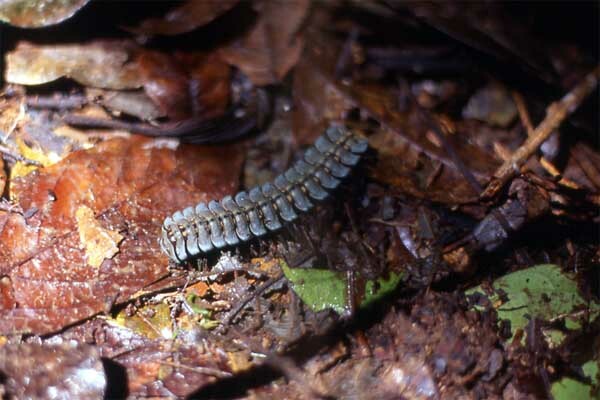 This millipede (in the order Polydesmida) is common on the forest floor, but is unusual in having a flattened profile, making it resemble a poisonous centipede. When disturbed, it curls up and emits a cyanide-based compound, smelling of almonds. Too little poison is emitted to hurt a person, but it's important to wash hands after handling live specimens. This type of millipede is especially abundant after rain dampens the forest floor. They roam around on the leaf litter, and you'll sometimes see pairs of them matinga behavior rarely seen if the ground is dry.